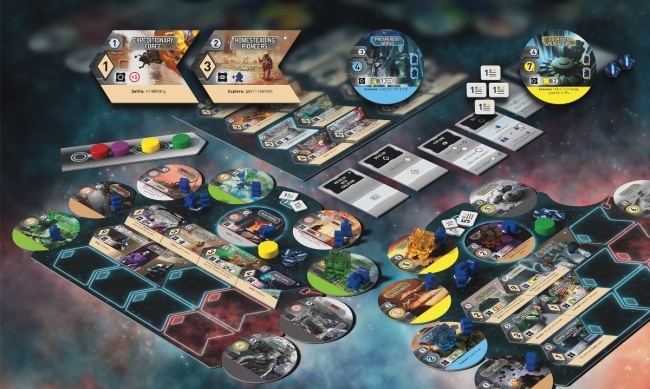 New Frontiers converts the themes and mechanics of the award-winning Race for the Galaxy card game into a board game format. Like the original game, players try to grow and develop their own interstellar empire over a series of rounds, earning points for accomplishing certain goals. In each round, every player chooses an action that all players get to take, but the player making the selection receives a bonus or upgraded version of the action. 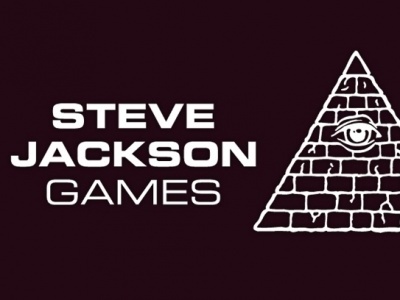 To increase replayability, the game uses variable goal cards chosen at the beginning of the game. 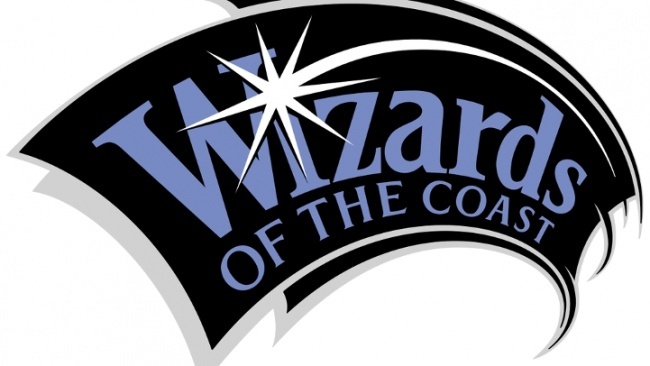 Once one of the game’s four end conditions are reached, the player with the most points wins. 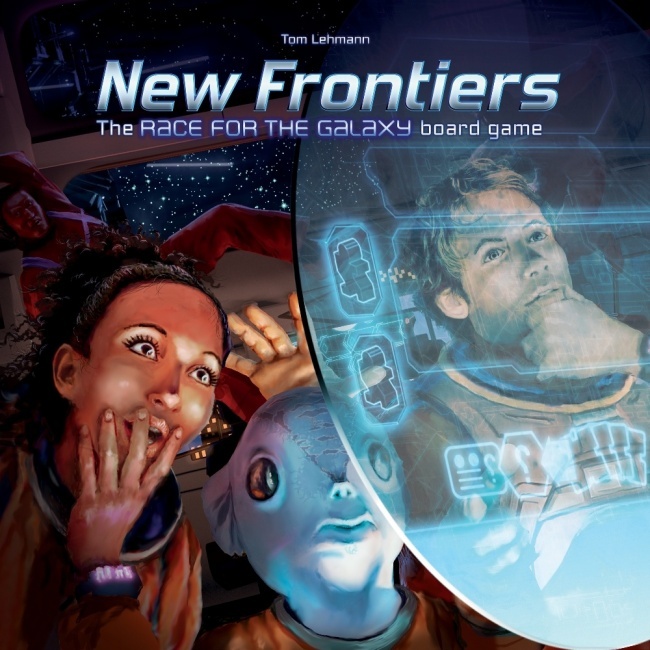 New Frontiers was designed by the creator of Race for the Galaxy, Tom Lehmann, who also designed Roll for the Galaxy, a dice-based version. The game includes 8 empire mats, 60 goods cubes, 60 colonists, 2 development mats, 56 development tiles, 60 wolrd tiles,7 action tiles, 8 goal tiles, 1 setup tile, 1 summary tile, 40 victory point chips, 56 credit chils, 1 priority tracker, 10 player disks, and 1 bag. The box weighs 8 lbs. 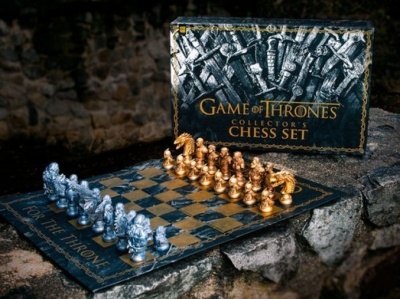 It is intended for 2 to 5 players, ages 14 and up, and takes between 45 and 90 minutes to play. MSRP is $74.95. 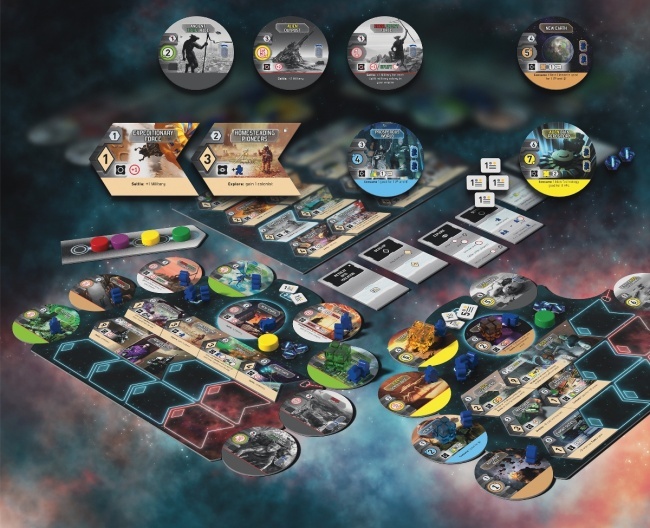 Rio Grande recently announced a new expansion for its flagship card game Dominion (see “‘Dominion: Renaissance’”), as well an English version of the board game Underwater Cities (see “Vladimir Suchy’s ‘Underwater Cities’”).